The Wrath of God takes place as soon as all people on Earth that had to receive the Mark of the Beast and the People that had to receive the seal of God – Received it. Rev 7:2-3 And I saw another angel ascending from the east, having the seal of the living God: and he cried with a loud voice to the four angels, to whom it was given to hurt the earth and the sea, Saying, Hurt not the earth, neither the sea, nor the trees, till we have sealed the servants of our God in their foreheads. and Rev 9:4 And it was commanded them that they should not hurt the grass of the earth, neither any green thing, neither any tree; but only those men which have not the seal of God in their foreheads. It starts with the Sounding of the 5th Trumpet, a Super Volcano that will erupt and cause 1 3rd of the World to Go in a Nuclear winter for 5 Months, During this time a Pest will breakout and this pest will bring the 1st Plaque, Bowl or Vail that will be poured out over all the bearers of the Mark of the Beast. Rev 9:1-2 And the fifth angel sounded, and I saw a star fall from heaven unto the earth: and to him was given the key of the bottomless pit. And he opened the bottomless pit; and there arose a smoke out of the pit, as the smoke of a great furnace; and the sun and the air were darkened by reason of the smoke of the pit. and Rev 16:1-2 And I heard a great voice out of the temple saying to the seven angels, Go your ways, and pour out the vials of the wrath of God upon the earth. Just before this Trumpet Sounded the 144 000 Jews that was selected by God 12 000 of every of the 12 Tribes will be Marked with the Seal of God in their Foreheads, so will the Christians that did not take the mark of the Beast. The Jews will flee from Judea, the newly formed Country of Palestine into the Jordan Wilderness Mountains and will Go into Angel Protection During the Great Tribulation Period of 1290 Days or 42 Months or 3 and half Years or Time, Times and half a Time. The Christians will then go into Angel Protection too , I call Psalm 91 Protection , were we will be lead, fed , protected and shielded by Angels for the full period of the Great Tribulation Period of 1290 Days or 42 Months or 3 and half Years or Time, Times and half a Time. Back to the Wrath of God, Plaque in Rev 16. This Super Volcano will bear insects that will sting the bearers of the Mark of the Beast and very painful sours will appear on the skins. For this there will be no medication to heal or relief the Pain. Just after this the 2nd Vail, Bowl or Plaque will be released called the oceans to Blood. All the salt water on Earth will change to stale blood of a dead person. All living creatures, Fish and mammals in the Oceans will die. Meaning no more Food from the Oceans. Then the 3rd Bowl, vial or Plaque will be poured out over all the Fresh Water on Earth. All fresh drinkable water on earth that is not Bottled or stored will be turning into stale Blood of a dead person. This will cause a chain reaction of death of Animals, Plants, Trees and humans. Rev 16:4-6 And the third angel poured out his vial upon the rivers and fountains of waters; and they became blood. Due to the scarceness of Food and Water, a Huge World war will break out for these Resources called the 6th Trumpet War or World War 3. 1/3 of the Population on Earth will die in this war! Just after this War the 4th Bowl, Vial or Plaque will be Poured out into the Sun, The Sun will burst and propel High heat towards Earth and call the People on Earth remaining will receive 1st Degree Burns and the Heat will be unbearable , Fires and destruction every were. Rev 16:8-9 And the fourth angel poured out his vial upon the sun; and power was given unto him to scorch men with fire. And men were scorched with great heat, and blasphemed the name of God, which hath power over these plagues: and they repented not to give him glory. After a While the Sun will explode and will Burn out totally, Darkening the Universe and all the stars including the Moon. There will be total Darkness on Earth! Night and darkness for at least 6 Months. This will cause extreme cold conditions for the Sun will not heat the Earth anymore, the only way to heat and light the Earth is with Oil. Oil fires will be burning over the Earth. This is the reason that the 3rd Seal stated that hurt not the Oil and Wine. Oil and Bottled Water and wines will become priceless for survival. Rev 6:5-6 And when he had opened the third seal, I heard the third beast say, Come and see. And I beheld, and lo a black horse; and he that sat on him had a pair of balances in his hand. With this Total Darkness on Earth, The Words of Jesus and other Apostles comes to Mind! 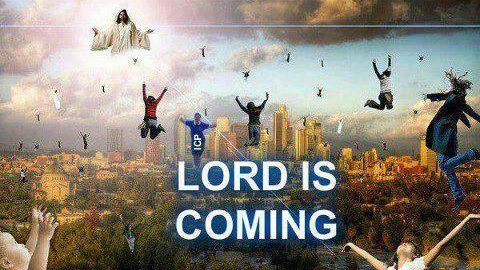 (1Th 5:2) For yourselves know perfectly that the day of the Lord so cometh as a thief in the night. Months later the Blood in the Euphrates River dries up and prepares a way for the World Army to come and Battle God at the Battle of Armageddon. Rev 16:12-14 And the sixth angel poured out his vial upon the great river Euphrates; and the water thereof was dried up, that the way of the kings of the east might be prepared. About 6 Months into the Total Darkness on Earth a Brilliant Light appears in the Sky, Every Eye will behold this Brilliant Light. This the 2nd Coming of Jesus Christ. The 7th Trumpet Sounds and all the Dead in Christ rises and meet Jesus in the Air and we that are still alive and in Angel Protection gets collected and change from mortal to immortal and meet Jesus in the Air. As we are taken to Heaven. Jesus and His Angels battles the Last Battle on Earth, called the Battle of Armageddon. At this Battle everybody on Earth Dies! And the Satan and his demons are locked up for 1000 Years until we return to the Earth in the Golden City to take care of the White Throne Judgment. Rev 16:17-21 And the seventh angel poured out his vial into the air; and there came a great voice out of the temple of heaven, from the throne, saying, It is done.